If you died in the United Kingdom or North America during the 18th and 19th centuries, there was a risk that your corpse might be stolen from your grave and wind up beneath a medical student's scalpel. But if you had enough money—or very good friends—there were ways that you could try to avoid that fate. Top image: "Death and the Antiquaries" by Thomas Rowlandson, via Ephemeral Scraps. Place a guard by the gravesite. The simple, low-tech method for preventing grave robbing was simply to have a human being stand guard over a freshly planted body until it had decayed past the point of desirability. However, during the 19th century, body snatching was a lucrative business; a fresh body could fetch more than £25, and a bribe could convince some guards to look the other way. The alternative was to station a friend or family member at the gravesite (or in the graveyard's watch house), but that wasn't necessarily a foolproof method, either. The Lancet's biography of Lancet founding editor Thomas Wakley oddly contains quite a bit of information about grave robbing methods, including one that involves the resurrectionists digging a hole several feet from the grave, tunneling toward the coffin, breaking in, and pulling the body up through the tunnel. "The friends of the deceased, seeing that the earth over his grave was not disturbed, would flatter themselves that the body had escaped the resurrectionist;" Wakley wrote, "but they seldom noticed the square of turf some feet away." Place the body in an Patent Coffin. One way to make the resurrectionists' job a bit more difficult was to invest in a better coffin. Wealthier folks might be interred in a mausoleum or a caged lair, but another solution was to place the body in a new kind of iron casket. In 1818, Edward Bridgman introduced the "patent coffin," an iron coffin with spring catches inside the lid. Even if a would-be resurrectionist managed to uncover the entire lid of the patent coffin, it was incredibly difficult to open, even with a crowbar. Mortsafe photo by Kim Traynor, via Wikimedia Commons. Place a Mortsafe around the coffin. Every now and then, you'll see pictures passed around the Internet of "zombie cages" in Scottish cemeteries, with the playful suggestion that the cages were designed to keep corpses from escaping. In actuality, they were put there to keep body snatchers out. Invented in 1816, the mortsafe is a metal box, a grate, a framework of iron bars that could be placed around a coffin or partially buried and set over the gravesite. One of the key advantages of the mortsafe is that it was reusable; after several weeks, the mortsafe would be removed from one grave and used to protect a fresher body. The more cage-like mortsafes certainly beat the mortstone, a slab of heavy rock placed on top of the grave, which failed to thwart grave robbers who would simply dig alongside the coffin and pull the body out through the side. Use a Coffin Collar. Compared to the patent coffin and even the mortsafe, the coffin collar was a relatively simple device. Since resurrectionists typically pulled corpses from their coffins through a hole, the coffin collar fixed the corpse to the coffin itself. The iron collar was placed around the corpse's neck and then bolted to the bottom of the coffin. If the resurrectionist wanted to remove the body without damaging it, he'd have to break off the wood around the bolts. Install a Coffin Torpedo. While most body snatching deterrents involved putting barriers between the dead body and the outside world, grave torpedoes, coffin guns, and cemetery alarms provided a more explosive solution to the problem of resurrectionists. Phil Clover's coffin torpedo would sit on the lid of a buried coffin and worked much like a shot gun, firing lead balls at whomever tried to dig up the coffin. Thomas Howell's grave torpedo was an explosive shell packed with gunpowder. The devices did occasionally kill hopeful body snatchers, warning other resurrectionsts to be careful where they placed their shovels. Booby trap the graveyard. Rather than set protective traps around a single body, some folks tried to ward off body snatchers by booby trapping the cemetery itself. For example, when someone in the town died, the locals might attach broken glass or other sharp objects to the tops of graveyard walls to prevent resurrectionists from scaling them, or lay spring guns near fresh graves, ready to fire upon any trespassers. Place the body in a Morthouse. Dead bodies were only good to anatomists so long as they were fresh, so some cemeteries set up morthouses so that the bodies would putrefy before they were buried. Multiple corpses would be stored in the buildings for weeks, until they had rotted enough to come off the anatomist's wish list. The morthouses were easier to guard than individual graves, and folks whose local cemeteries didn't have morthouse might let their dead bodies remain unburied at home, where they could easily keep an eye on them. In After We Die: The Life and Times of the Human Cadaver, Norman L. Cantor notes that summer was the best time to die if you were looking to avoid the resurrectionist. There were no medical classes in session then, and your body would rot more quickly in the heat. Create a legal means of obtaining bodies. What finally staunched the flow of illegal bodies pilfered from graveyards to medical schools was not some clever device but legislation. In 1828, William Burke and William Hare were convicted of murder, allegedly having killed 16 people in order to sell their bodies to medical schools. 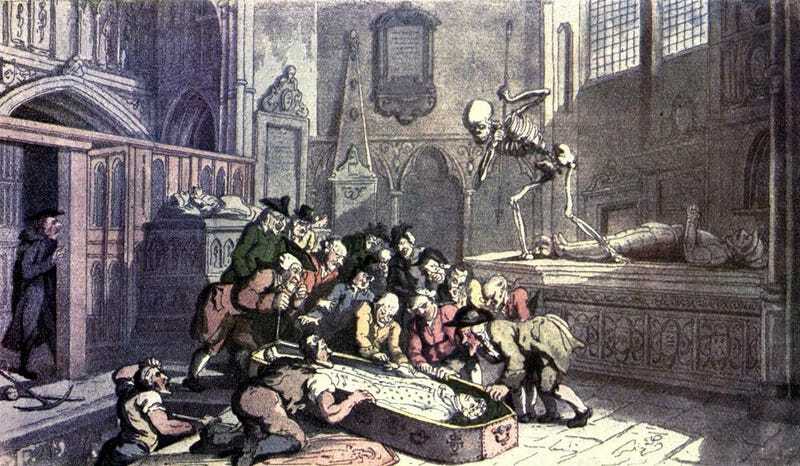 In 1832, the UK Parliament passed the Anatomy Act, making it legal for doctors, anatomy teachers, and medical students to dissect donated corpses, which virtually ended the resurrectionist practice. Similar acts popped up around the United States, and while these laws didn't completely eliminate the shortage of anatomical materials, increasing the legitimate sources of corpses proved more practical than burying bombs with dead bodies.